This Similan Diving Sites is a popular dive spot for Thailand liveaboard cruises. Located on the east side of Similan Island No. 5 & 6 (Koh Ha & Koh Hok), stretching to the southern tip of Island 5. This reef consists of a gently sloping sandy ridge starting at about 5 metres going to about 30 metres out in the blue. This sandy slope is dotted with coral and rock patches all the way down the eastern side of the dive site, the coral is a mixture of hard and soft varieties with some large sea fans. These coral patches are home to many small reef fish such as Damsels, Anemone fish, Angel and Butterfly fish, these in turn attract large schoals of Gold Stripe Fussilier and Five Line Snapper. Large groups of Forsters Barracuda are often seen here as well as small Tunas and Trevallies. Also look out for Octopus hiding in holes in the coral. Between the coral patches the bare sandy slope is alive with Garden Eels, also keep an eye out for Bent Stick Pipe Fish and the blue spotted Kuhl’s Stingray in the sand. 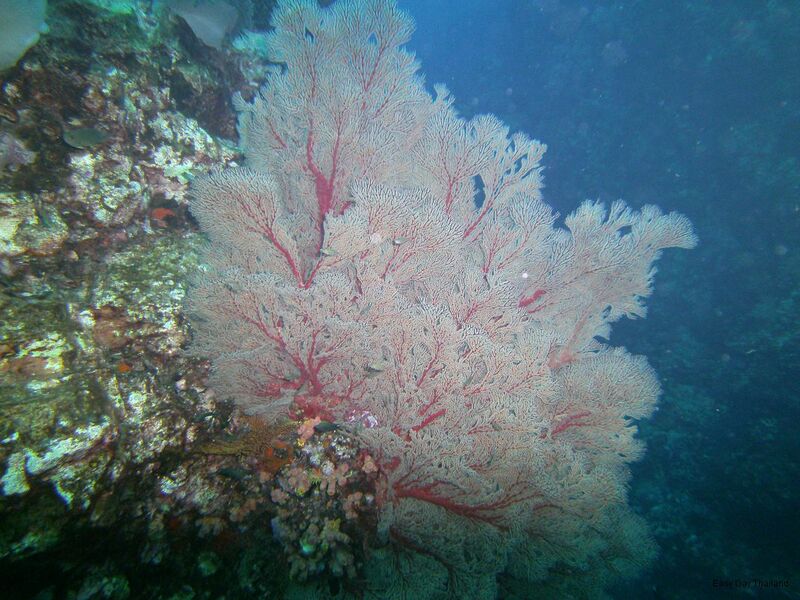 Towards the southern end of the dive site is a large coral mound rising from 20 metres up to 12 metres. This pinnacle is covered in life, clouds of fish and loads of macro critters such as Nudibranchs, Durban Dancing Shrimp, Banded Boxer Shrimp and Coral Crabs. Because of this the bommie has been named “Hin Muan Deaw” which translated is “whole roll rock” (as in roll of film – in the old days that’s what we used to take picture, perhaps is should be renamed 16 gigabyte rock!!). To the south of Hin Muan Deaw the sandy reef finishes in a group of enormous boulders which are home to many types of Moray Eel and Napoleon Wrasse, there is often a turtle or two in this area.